Good, affordable, lightweight word processors are rare finds on the App Store, and that’s what makes Document Writer 1.2 (Mac App Store link) such a compelling product. It’s not going to rival the full product of Microsoft Word, but it’s certainly a step up from Open Office and even may get some defectors from Google Docs. Document Writer has a fairly intuitive interface, with tools that you’ve come to expect: paste, cut, undo, redo, print, save, text size, color, insert image, insert boxes, find, URL creation, and numerous formatting buttons. Changing from normal spacing to double is a breeze, and creating numbered lists, columns, and other more particular formatting demands are equally easy. Again, it’s not as expansive as Microsoft Word, but understanding the numerous unmarked buttons takes only a few seconds. I especially appreciate the ability for Document Writer 1.2 to be able to export into a variety of formats, including .doc, .docx, .txt, and .pdf formats. The spelling and grammar check are also useful, if not particularly robust. I also prefer how Document Writer handles lists and image inserts (both floating and wrapped) as compared to Google Docs, so kudos to developer Xiong Feng there. There are some aspects that you may miss if this is your first foray into a streamlined word processor. The ability to find out a document or text selection’s word count, for example, requires you to find the Document Info item on the File drop-down menu—not exactly intuitive. The buttons are all fairly self-explanatory, but hovering over them should generate some type of explanation as to what they do. Scrolling through long documents can be a bit wonky at times and a tutorial might also be a good idea, even if the majority of the user base will find the word processor, if anything, simplistic. 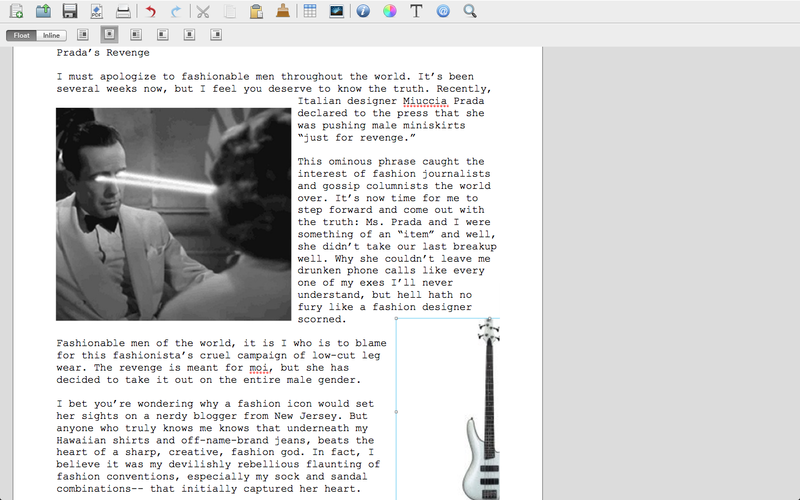 Still, those who need a tuned-down, no frills word processor could do a lot worse than Document Writer.